The menu offers a choice of meats, tofu or veggies with curries. 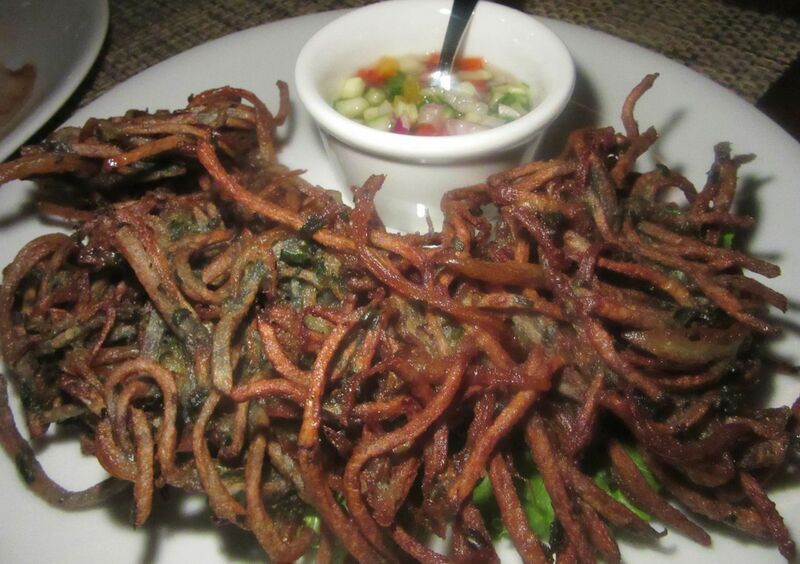 This is panang with a fried filet of branzino. I’m not sure why I’ve never been to Thailand. I took my hunger to China early when everyone still wore Mao suits. We lingered in Hong Kong, spent a month in a hotel in Beijing, visited Taipei with David Keh, and first explored the temples of Angkor Wat in Cambodia when we needed to stick to the path or risk stepping on a land mine. That was when my guy Steven was alive, and I shared my critic’s job at New York magazine, three months on, three months off. The entrance, leading to a narrow space between the wall and the bar, doesn’t promise much. The two of us returned to witness the rebirth of Cambodian tourism with Michelin-starred chef Sotha Khunn after Pol Pot gave back his mother’s weekend house in Siem Reap. We returned often to Hanoi, once renting a hotel room for $10 a day. We scouted Sapa in the north and inspected Vientiane in Laos. But somehow we missed Thailand. After Steven died, I grew less adventurous. 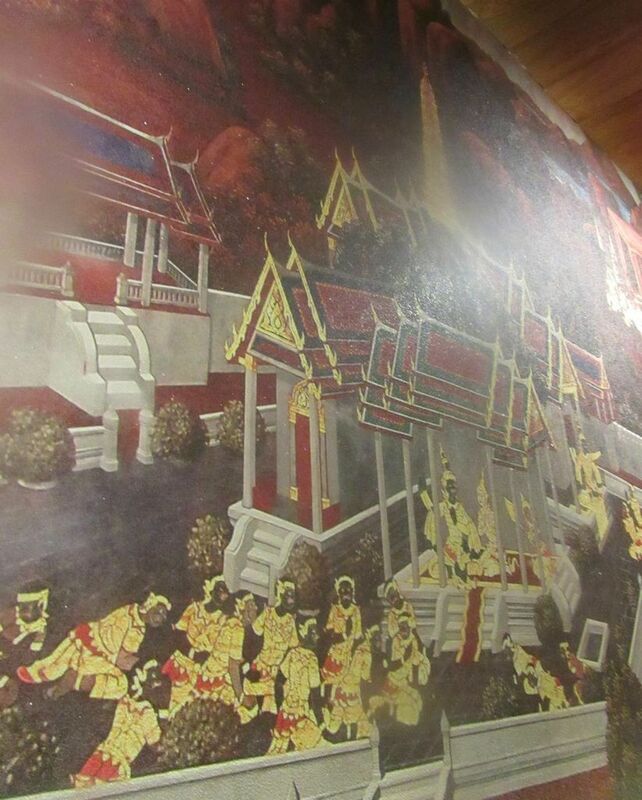 The walls of the back dining room are papered with fanciful buildings and warriors. 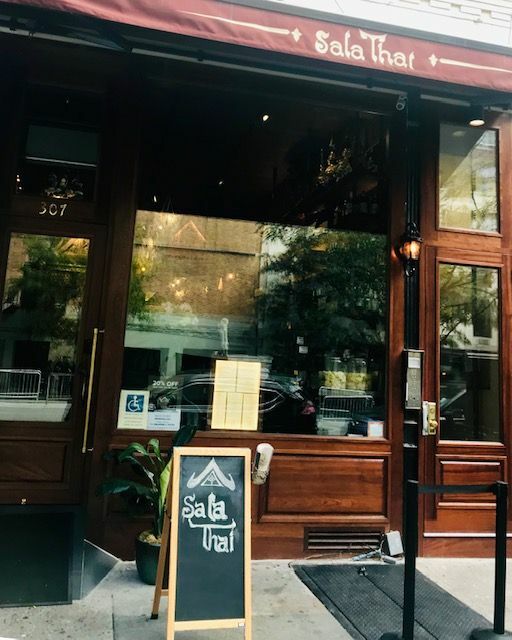 Now, suddenly, here it was, a celebration of Thai cooking, classic and imagined, at Sala Thai, a few blocks from my nest on the Upper West Side. I hadn't noticed its late August landing. That first Monday we have to push through the bar crowd in the narrow space leading to a hostess directing traffic. 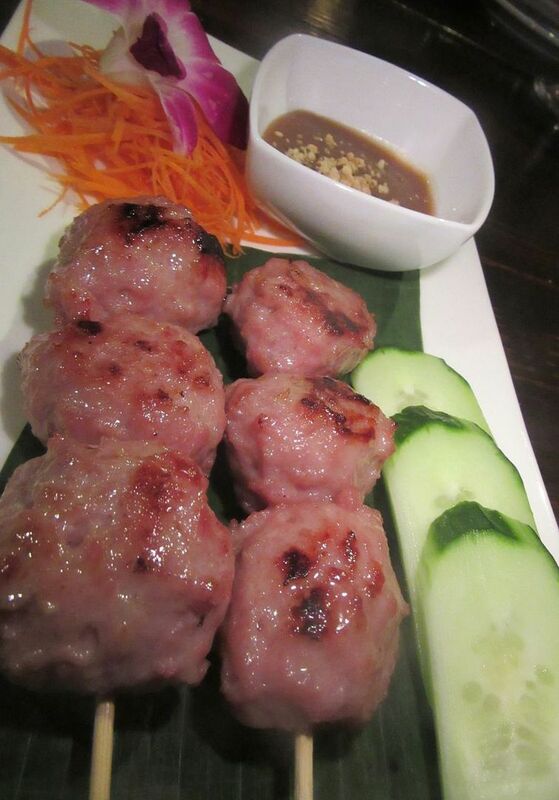 Marinated chicken is wrapped in pandam leaves and served with thickened sweet soy sauce for dipping. 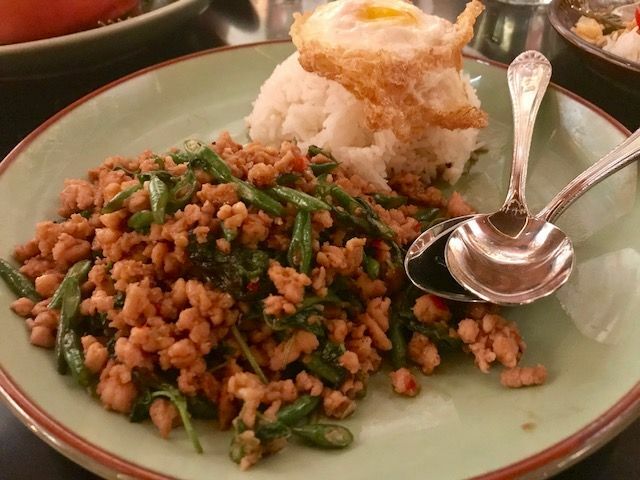 Krapraw Gai Sub is spicy minced chicken with string beans, Thai basil and a fried egg. Puff pastry is filled with minced salmon, garlic, cilantro and white pepper and deep-fried. 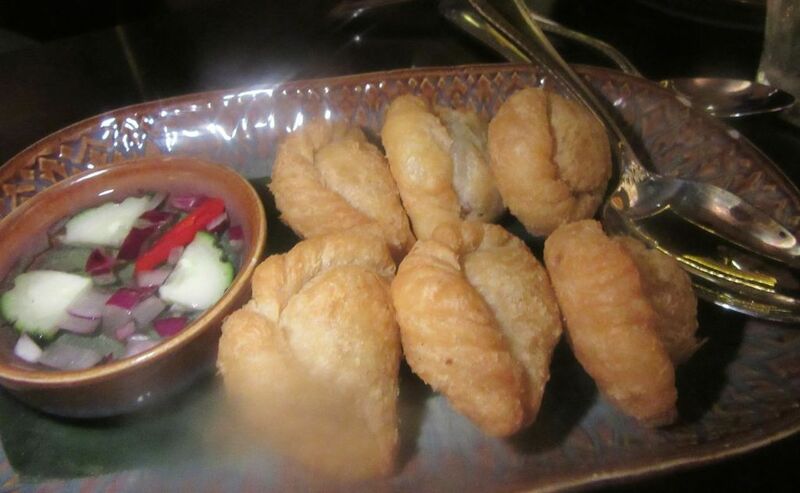 Thai crepe dumplings are filled with minced chicken, peanuts and sweet turnip. Dana wants pad thai, but not just any old pad thai. She studies the options as I step in and order what catches my eye. 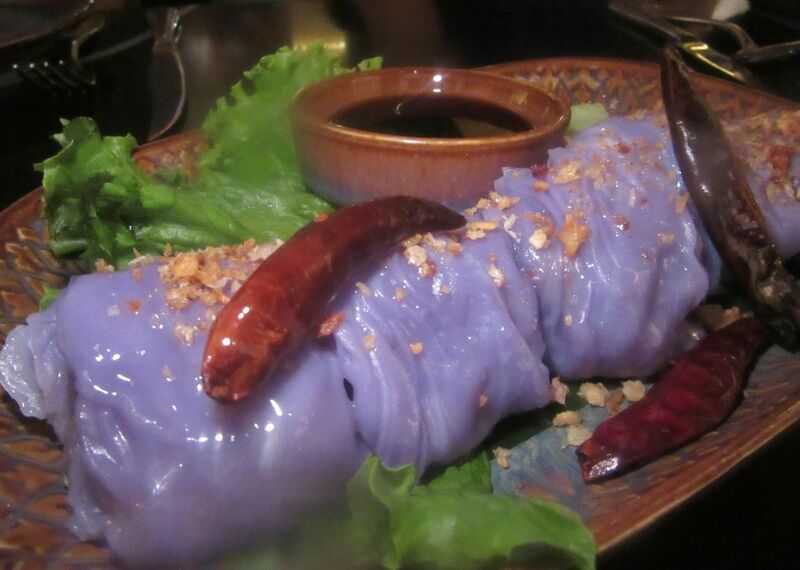 Eerily blue Thai dumpling, so delicious. Pub Sin Pla, minced salmon stuffed pastry puffs with garlic and cilantro. There is a discernible but mute kick from the chiles in my “Street Food” choice, minced chicken with string beans and Thai basil topped with a fried egg. Pad Thai Bolan combines noodles with sprouts, string beans and bean curd in an egg net with prawns on top. 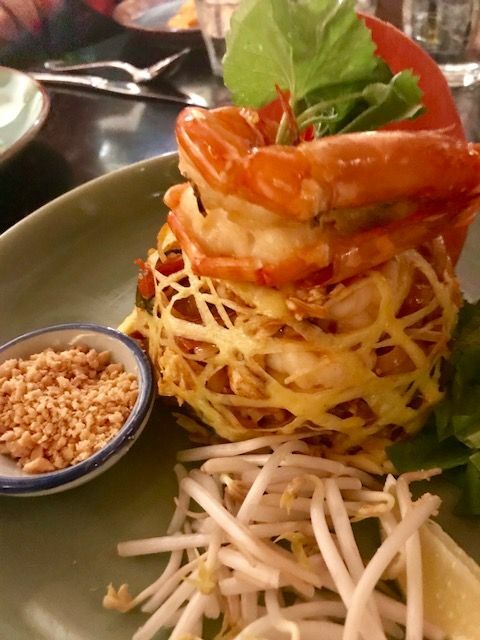 Our impressive pad thai variation -- Pad Thai Bolan -- swirls rice noodles with the usual bean sprouts, red onions, and peanuts plus green beans, bean curd and a tiara of oversize prawns all dramatically wrapped in a net of egg. Pan seared duck beast salad with chili-lime roasted rice powder dressing and black sticky rice in leaf packages. 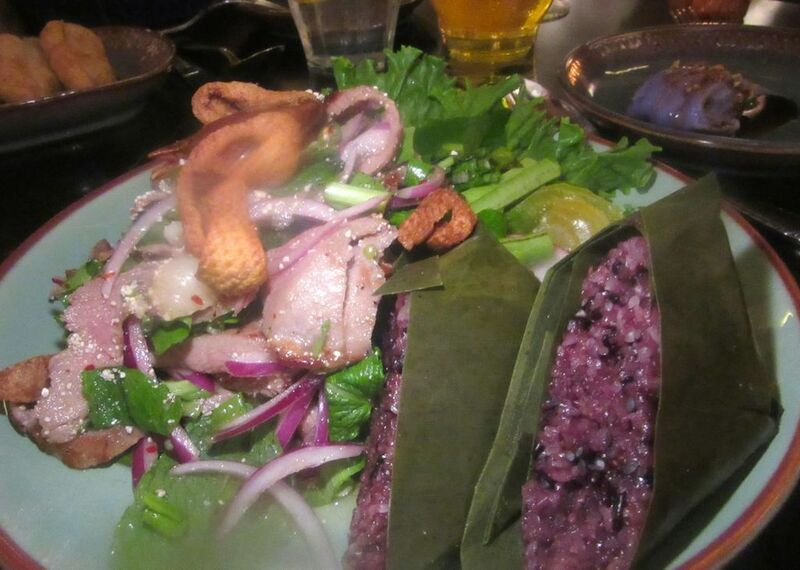 The spicy duck salad with its chewy slices of breast meat, Thai chili-lime roasted rice powder dressing, and black sticky rice in two banana leaf wrappers is not my idea of Thai heat, but it’s otherwise full of good flavor. 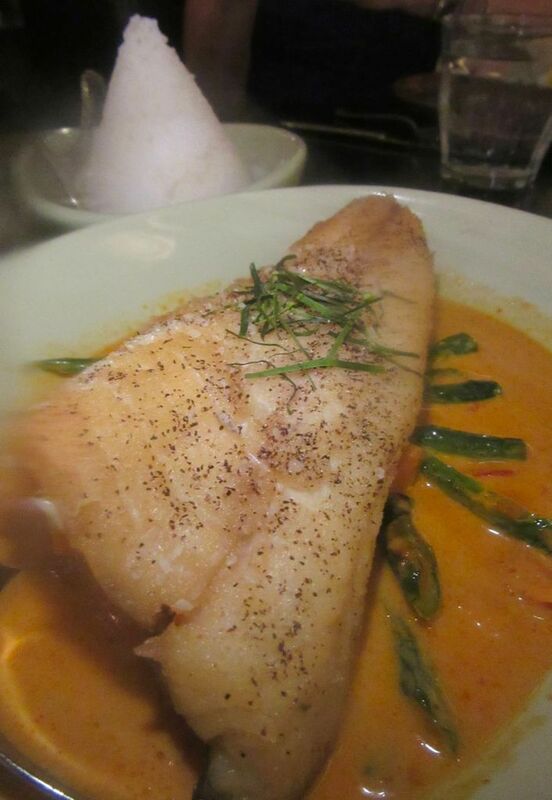 Choosing a fried branzino filet to float in the coconut perfumed Panang curry turns out to be an excellent ad lib. 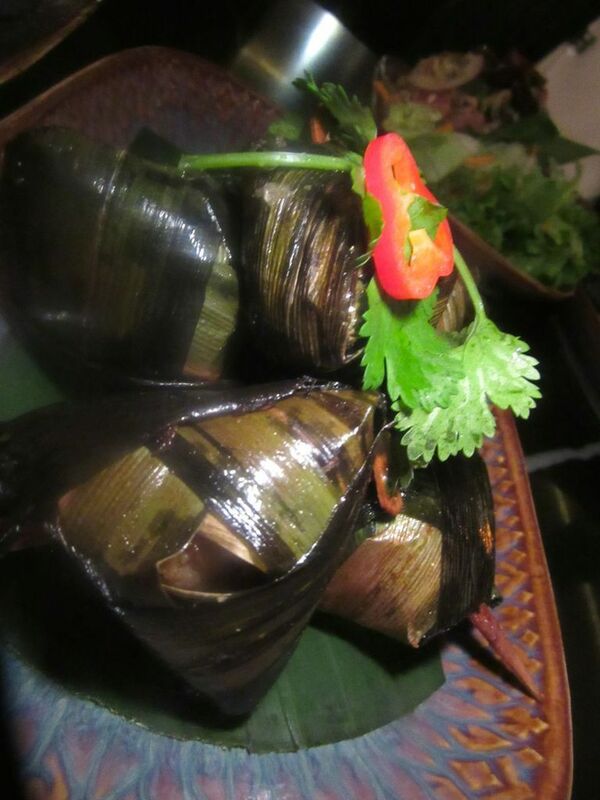 Taro puffs are stuffed with minced shrimp, roasted coconut flakes, cilantro and kaffir lime leaves. I feel doomed never to get Thai food as torrid as I like it. I don’t want everything to be paralyzing. That would cancel out the more subtle diversity. But each time I’ve been to Sala Thai, someone in my group, if not everyone, asks for “less spicy” or “not too spicy” and I hesitate to order anything they won’t eat. 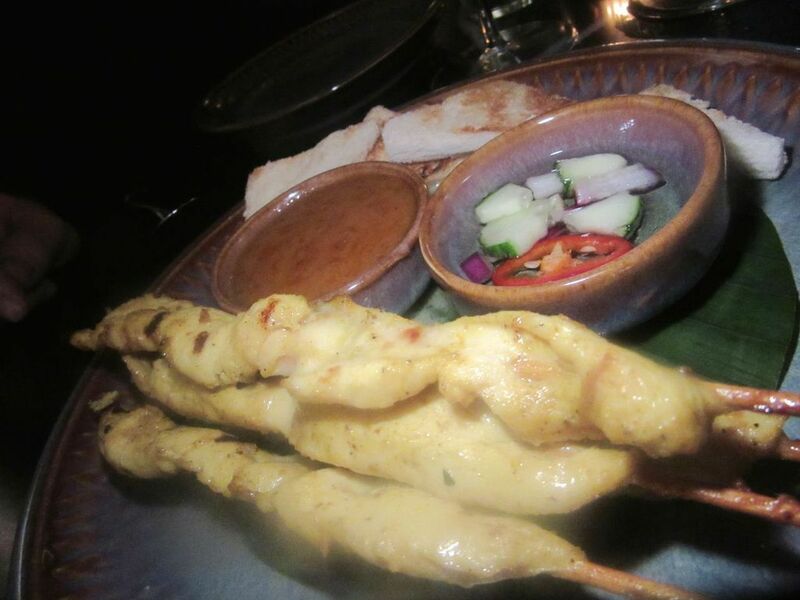 Grilled chicken satay on skewers with peanut sauce and toasted brioche sounds better than the dried bird it is. On my following visit, Taro puffs stuffed with minced shrimp and roasted coconut flakes go well with the mellow white wine my friend Bob chooses, a $42 bottle of Grüner Veltliner. I’d like to forget the listless chicken on skewers, grilled until certifiably dead. 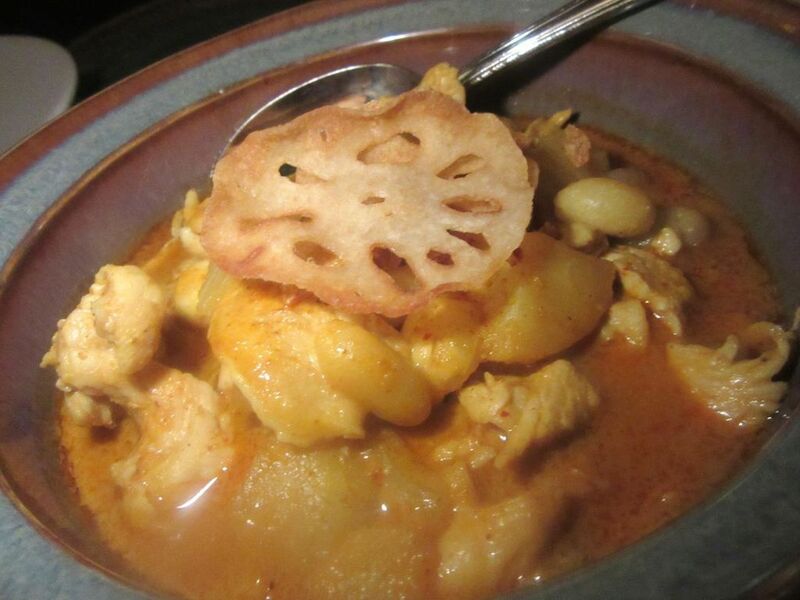 More boring chicken breast in a tasty Massamun curry with potatoes, peanuts, lotus seed and coconut milk. In fact, overcooked white meat chicken does nothing either for the Massamun (sic) curry -- an otherwise haunting porridge with peanuts, lotus seeds and coconut milk. Not all of us are game for the chewy razor clams with chili three ways (and still tame). But the pineapple fried rice with cashews and a fried egg is a universal favorite. 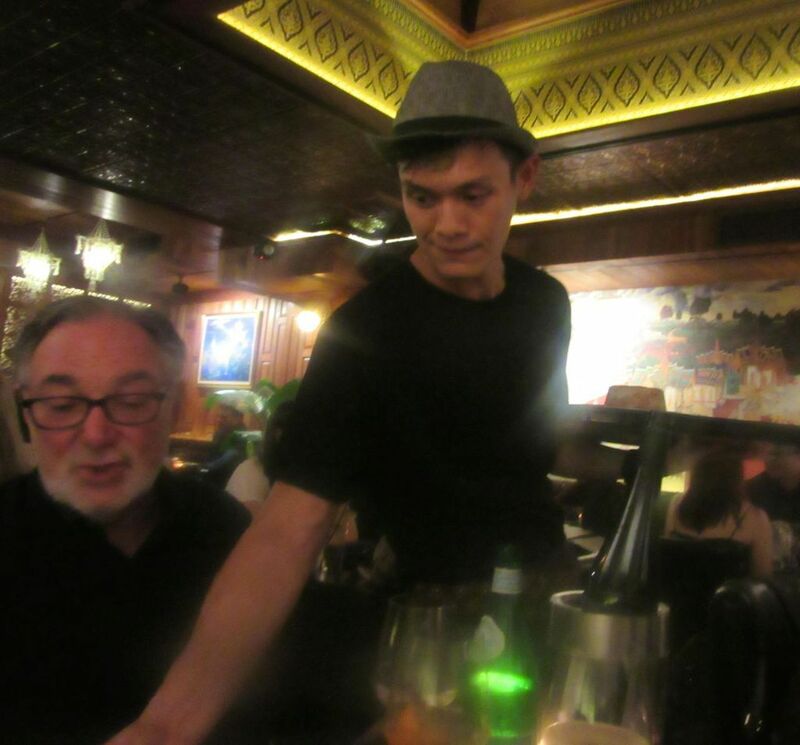 The servers lunge and duck and soar across the room trying to keep up with questions, orders and demands. The servers have the energy of non-professionals, swooping around to cover the crowd. I’m amused to see the house is undecided culturally. When one of us asks for chopsticks, we are reminded that the Thai use spoons. Next time we come, chopsticks are on the table. 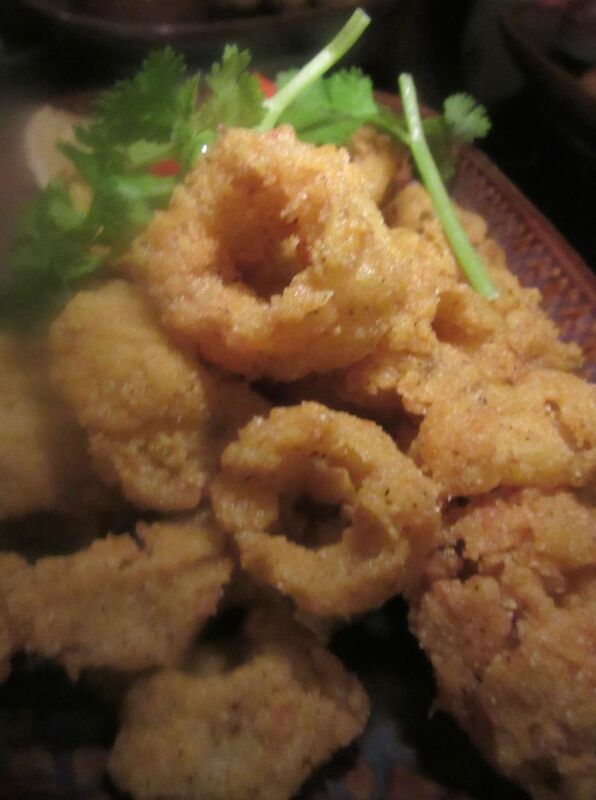 Crisp-fried turmeric coconut calamari with roasted bell pepper vinaigrette have a reheated taste. 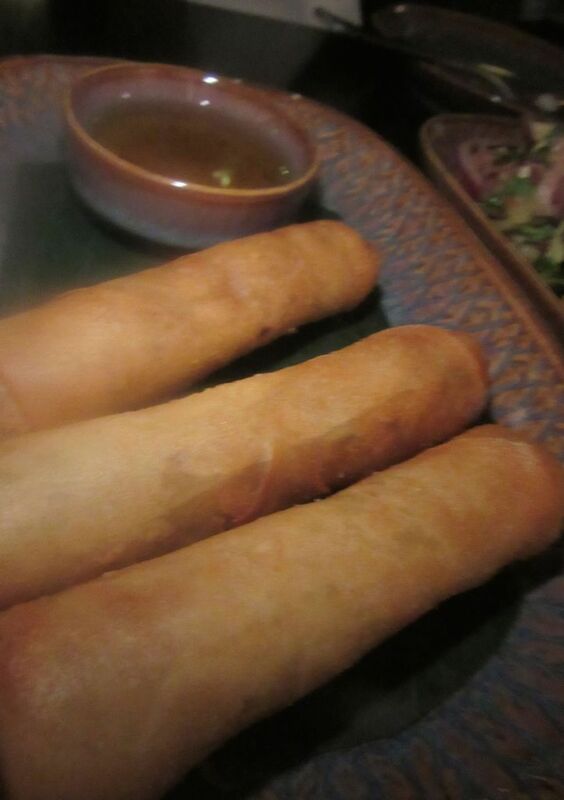 The menu lists cabbage, glass noodles, taro root and shitake inside these skinny spring rolls. I still feel there’s more gold to discover on Sala Thai’s four-page menu. I invite friends who confess they’ve never eaten Thai food before. I start us off with what will seem familiar. Fried calamari with a bell pepper-and-peanut vinaigrette, and crispy spring rolls stuffed with a mince of cabbage, taro root, shitakes and cabbage; plum sauce on the side. Thai pork sausage tops crispy rice salad mixed with curry paste and crispy jasmine rice. 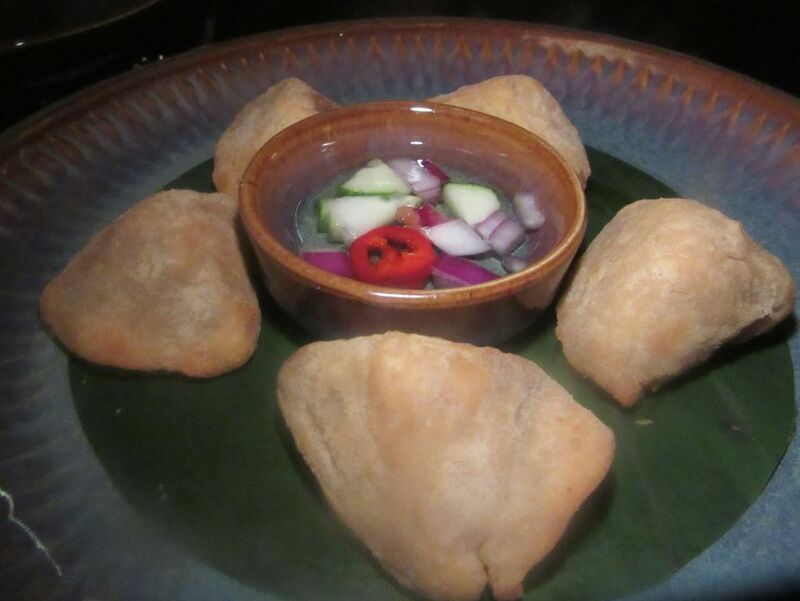 Curry puffs filled with minced chicken and potato served alongside sweet cucumber relish are easy too, as is chicken wrapped in pandan leaves. Everyone likes the crispy rice salad with pork sausage and scallions mixed with curry paste. 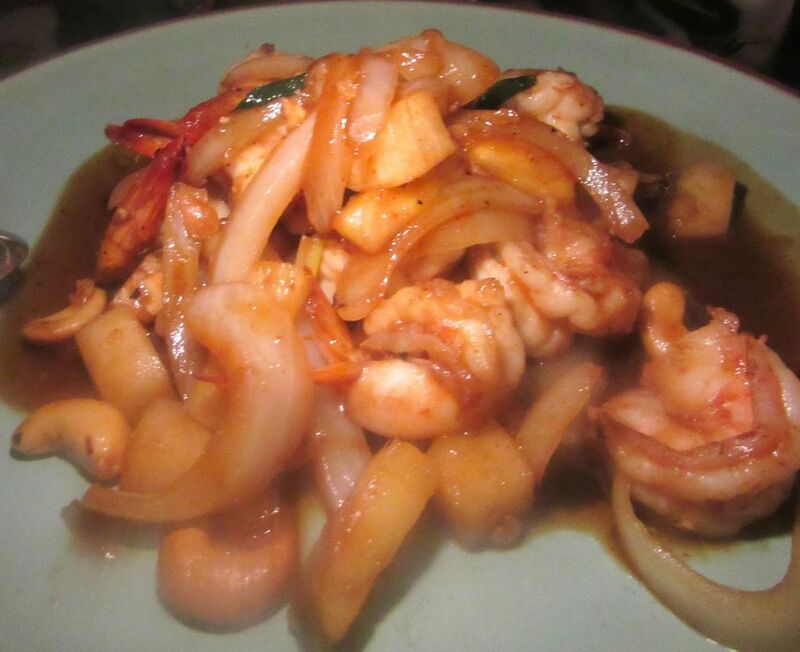 I chose shrimp as our choice for the cashew nut dish with pineapple, jicama and chile jam. 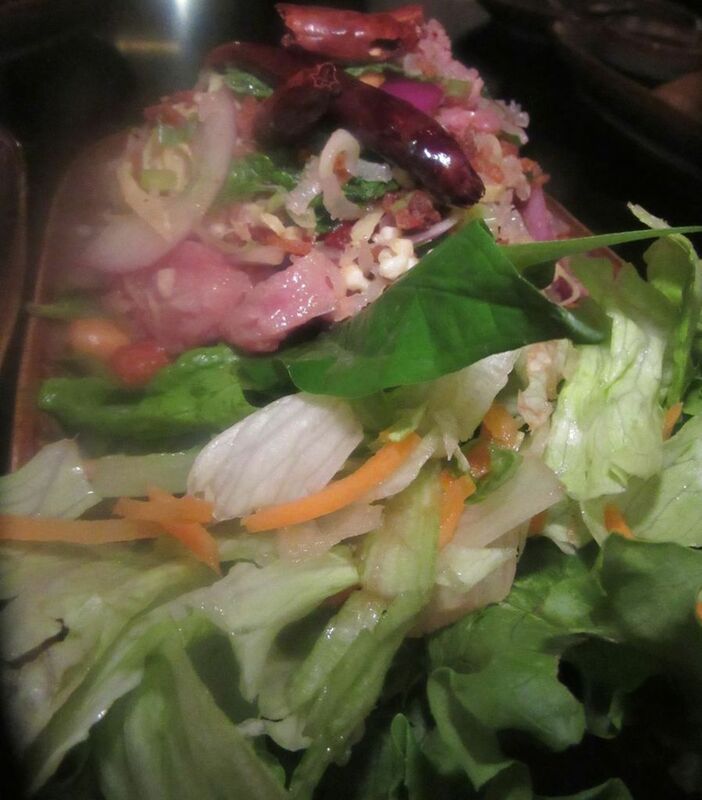 I planned to order corn salad with a duck yolk but get a little panicked by the waiter’s floating attention and ask for the duck salad I liked before. These Thai food newbies fill up on the small plate starters and don’t seem to appreciate the cashew nut dish with shrimp, pineapple jicama and chili jam or the branzino in red curry as much as I do. 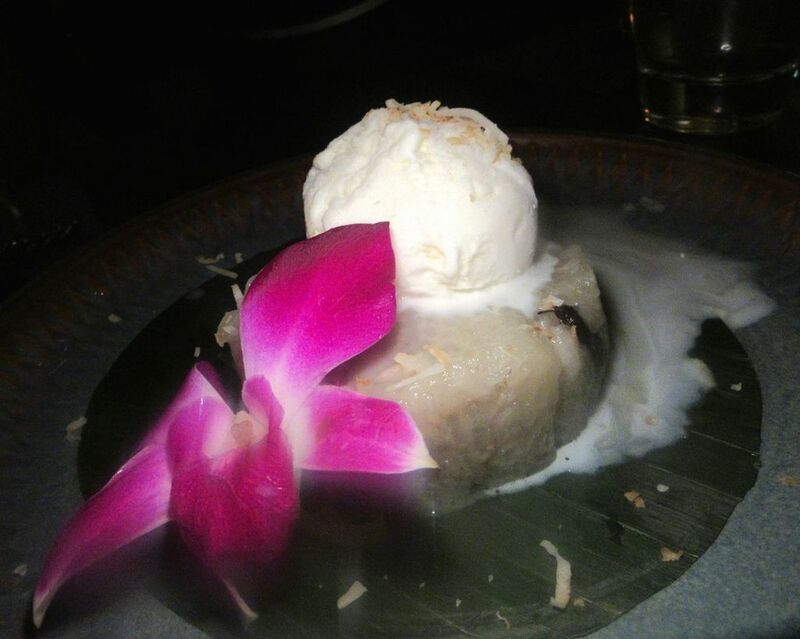 The Thai medley compote with so many exotic ingredients seemed the dessert to share. At dessert time, the Thai Medley Compote sounds ominously overloaded with ingredients -- but quickly disappears with four spoons dipping in. In just a week, I watch the neighborhood discovering Sala Thai. The greeter at the door gets more bossy. We're forced to wait 15 minutes for our table. The servers, sweet and agreeable, seem stretched. We still have to ask for serving spoons as plates arrive, sometimes twice. The house is totally booked on the weekend. I’m sure the host will never remember me as the old lady pouting. I’ll call ahead for a table anyway and so should you. Sala Thai 307 Amsterdam Avenue between 74th and 75th streets. 212 433 3999. Lunch Monday through Friday 11:30 am to 3:45 pm. Saturday and Sunday noon to 3:45. 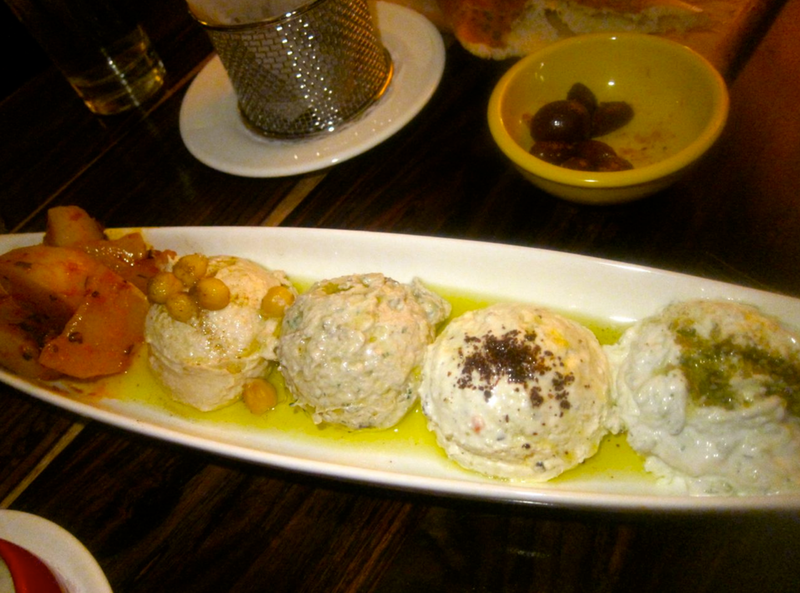 Dinner Sunday through Thursday 5 pm to 10:15; Friday and Saturday 5 pm to 11:15.